Rebound partially attributed to a sharp drop in oil prices. HONG KONG, Feb 9, 2016 - (ACN Newswire) - The YPO Global Pulse Confidence Index of CEO economic sentiment for Asia rose 2.4 points in January to 59.7, after having declined 10 points in the previous five quarters. At its current level of 59.3, confidence in Asia is slightly higher than the global index, which held steady at 58.0. This indicates that while economic confidence in Asia has waned over the past two years, it is now more aligned with confidence around the globe. The increase in confidence by YPO leaders in the region appears surprising given the collapse of global stock prices triggered by the slowdown of China markets and the dramatic decline in oil prices. While global investors feared these were signs of anemic growth, YPO members in Asia are more confident than they were three months ago. The upswing in confidence is most pronounced in China where sentiment jumped 10.0 points from 52.0 to 62.0. "The sharp drop in oil prices could, in fact, provide considerable stimulus to economic activity in Asia. In particular, the largest economies in Asia - China, Japan, India, and South Korea - along with Taiwan and Thailand are oil importing countries that will benefit significantly from the price drop. Lower gas prices should leave consumers with more money to spend on other goods and services," said Boon Wee Kuah, CEO of MTQ Corporation and a member of the YPO Singapore Chapter. 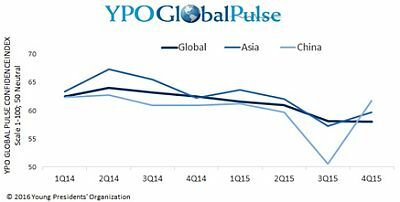 Globally, the YPO Global Pulse Confidence Index remained essentially unchanged at 58.0 in the fourth quarter of 2015, its lowest level since the third quarter of 2011 at the height of the global economic recession. Confidence in the United States slipped 0.8 point to land at 59.1, while Africa dropped 3.3 points to 51.0. The European Union remained almost unchanged, gaining 0.3 point to land at 60.5. Only Asia, which edged up 2.4 points to 59.7, and Latin America, which jumped 4.8 points to 54.4, recorded any material increase in economic confidence. This represents a convergence of sales, employment and investment indexes for the three largest regions. As Asian economies have slowed down, the U.S. and European economies have steadily rebounded to the point where the three indexes are virtually indistinguishable. While the global index is still below the range of 63.0-64.0 that was prevalent two years ago, this is a healthy level consistent with moderate growth in the coming year. Sales, employment and fixed investment outlooks improve for 2016. CEOs in Asia reported a more confident outlook across the three major indexes for the next 12 months. The YPO Sales Confidence Index for Asia jumped 3.5 points in January to 66.4, with 67% of CEOs expecting an increase in sales over the next year. The Employment Index for Asia rose 1.2 points in January to 57.0, still slightly below reported levels in the past couple of years, but 32% of CEOs expect to increase headcounts in the coming year. The Investment Index for Asia rose 2.9 points in January to 60.9 after falling 6.5 points in October due to fears of a much sharper than expected slowdown in China. Nearly half of respondents (45%) anticipate an increase in fixed investments in the next 12 months. ASEAN CEOs more optimistic despite weakening economies. CEO economic confidence rebounded in the Southeast Asia region, increasing 7.6 points to 60.2. Emerging economies in Asia are facing challenges in part because of the growth slowdown in China as well as the sharp increase of the value of the U.S. dollar, which has increased production costs, reduced demand, and thereby curtailed economic activity. In addition, China is a major importer of goods from the ASEAN countries, South Korea, and Japan, and the slower pace of economic activity in China greatly impacts these economies. This weakness in emerging economies was evident last quarter in the YPO Global Pulse Index for ASEAN countries - Indonesia, Malaysia, the Philippines, Singapore, Thailand, and Vietnam amongst others - which fell to its lowest level in six years. This quarter, YPO members in ASEAN reported a marked increase in their confidence regarding sales, hiring and fixed investment expectations. The YPO Sales Confidence Index for ASEAN nations jumped 9.8 points to 67.8 while fixed investment increased an impressive 9.1 points, landing at 64.4. Hiring expectations were optimistic as well, with confidence climbing 5.2 points to 60.6. CEO confidence in China rebounds after a year of decline. The upswing in confidence across all of Asia in January was most pronounced in China, where sentiment jumped 10 points from 52.0 to 62.0. At an index of 62.0, confidence among YPO members in China is higher than other large economies in Asia, including India and Japan. In 2015, GDP growth for China was 6.8%, as projected by the IMF last April; the value of the yuan depreciated slowly during the past two years, bolstering exports and countering any further slide in domestic growth; and, stock prices in China, as measured by the Shanghai Composite Index, rose 30% in the past 15 months, signaling moderate growth in Asia. CEO confidence in India continues its steady decline. The CEO confidence index in India fell another 1.5 points to 60.8. This is the eighth consecutive quarterly decline amid concerns about the slowdown of the Chinese economy and falling commodity prices. CEOs in construction, production and services sectors are marginally less confident in Australasia. The CEO confidence index for Australasia fell 1.0 point to 58.2 in January. Across the board, CEOs in all major sectors reported less confidence than a year ago. When asked to look ahead six months, 42% of Australasian CEOs in the production sector thought economic conditions would improve over the next six months, while CEOs in the construction and service sectors were less optimistic. The quarterly electronic survey, conducted in the first two weeks of January 2016, gathered answers from 1,994 chief executive officers across the globe, including 229 in Asia. Visit www.ypo.org/globalpulse for more information about the survey methodology and results from around the world. YPO (Young Presidents' Organization) is a not-for-profit, global network of young chief executives connected through the shared mission of becoming Better Leaders Through Lifelong Learning and Idea Exchange(TM). Founded in 1950, YPO today provides 23,000 peers and their families in 130 countries with access to unique experiences, extraordinary educational resources, access to alliances with leading institutions, and participation in specialized networks to support their business, community and personal leadership. Altogether, YPO member-run companies employ more than 15 million people around the world and generate US$6 trillion in annual revenues. For more information, visit www.ypo.org.